Ludwig van Beethoven was truly an eccentric musical genius ? composing a brilliant piano sonata one minute, throwing eggs at his maid the next. This 5-1/4" (13.3 cm) tall, hard vinyl action figure has move-able arms and legs, allowing him to sit on the 1" (3.8 cm) plastic piano bench included. Comes with instructions detailing how to download the amazing fold-up paper piano from the Internet for free! 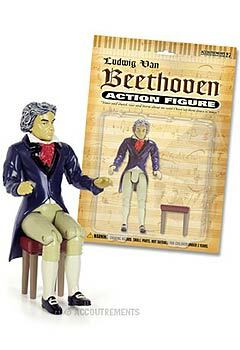 Make eccentric music with Beethoven Action Figure @ VortexGifts.com today!